Cod, cured by smoking, gives great flavour to the dish. This recipe is quick to prepare thanks to KNORR Superior Instant Mashed Potato which saves precious prep time. Poach cod until cooked then cool, remove skin and any bones. Flake. Heat the water, when boiling turn off heat, add KNORR Superior Instant Mashed Potato and whisk until thick and smooth. Cool to room temperature. Combine mash with cod and herbs. Roll mixture into 60g balls. Dust balls in flour, dip in egg and then breadcrumbs. Chill for 20 minutes. Combine HELLMANN’S Real Mayonnaise and lemon juice. 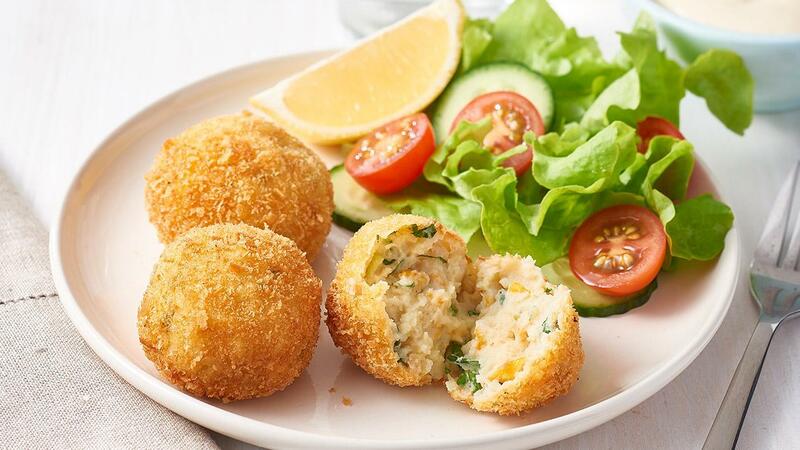 Deep fry smoked cod balls in batches until golden and cooked through. Drain. Serve with lemon mayonnaise, lemon wedges and salad or steamed vegetables.